This is absolutely gorgeous, I love the colors! I love the hand quilting, I think it completely makes the quilt! This is just beautiful! Its so true, I feel I get more quilting done @ the long arm than if I plan at home. At home I can never seem find the right time to quilt. 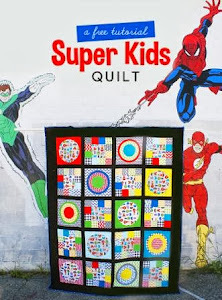 Your quilt is just awesome and I love the little hand stitching around the hexies. Love the binding fabric you choose. Spectacular! 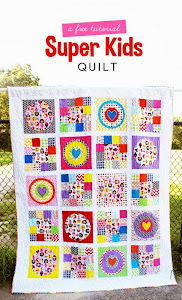 What a wonderful way to include some hexies in a quilt! Great design! This quilt is so adorable. Lovely finish!! Laurie, it's so cute! I love the "fussy cut" hexies especially. Thanks for linking up to Craft Book Month!